Set in the small town of Devil’s Gate, North Dakota, the film examines the disappearance of a local woman and her young son. FBI Special agent Daria Francis helps the local sheriff search for answers. Partnering with a deputy, they track down the missing woman’s husband and find that nothing is as it seems. or as god is my witnessI will not be responsible for what happens! An onrushing hot rod that suddenly breaks down near an awful looking, abandoned farm with lots of barbed wire and warning signs. There are squeaky doors and you can hear a howling wind while the person with car trouble is looking for someone who can help him. And then he experiences that awful moment. Something he did not see coming. I immediately sat straight up in my chair and expected an intense horror. Especially when the title of the film is “Devil’s gate”. The poor, dilapidated farmstead and the desolate environment immediately reminded me of “The Texas chainsaw massacre”. A no-man’s-land where a psychopathic, crazy family terrorizes and kills lost tourists so they can brew a hearty one-pan meal afterwards. To my disappointment, the movie title turned out to be the name of the town where the story takes place. Lot of diversity in this movie. To be honest, the first part of the movie was tremendously fascinating. A missing woman and her son. The F.B.I. Agente Daria (Amanda Schull) who, together with the local policeman Colt (Shawn Ashmore), investigates the disappearance of both persons. And the downright suspicious acting Jackson Pritchard (Milo Ventimiglia) where the two enforcers of the law finally arrive. And when the two law enforcement officers make a rather disconcerting discovery in the Jackson cellar, the film will take a completely different turn. That’s the biggest plus of this film. The surprise effect is huge. You are repeatedly misled. One moment you expect a sort of “Silence of the Lambs” serial killer scenario. Then you come to the conclusion that this film has an “X-Files” vibe. Such a movie you’d come across on some SyFy channel. Unfortunately, the quality of this indie SF drops as the film progresses. I wasn’t interested in the religious aspect. The “an eye for an eye” principle was rather laughable. Despite the sometimes high-quality special effects and generally not so bad acting (with even a cameo of the Star Trek veteran Jonathan Frakes), this film didn’t really appeal to me. It seemed as if a whole arsenal of ideas and proposals were being collected and subsequently they didn’t know anymore which direction it should go. In the end it felt as if I had watched a pilot episode of the umpteenth television series. 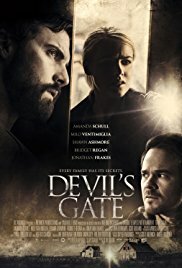 “Devil’s gate” is such a film where the story doesn’t really match the footage when it comes to quality. Unfortunately. Because it had potential.